The best food dehydrators are great for making several types of food, and when used often, they can save you a lot of money. Fruit leathers and jerky are two popular types of food that you can make with a dehydrator, and as families look for healthier food alternatives, the popularity of food dehydrators will continue to grow. When shopping for a top food dehydrator, you should know that most products come with the same functionality, and the unique features are what make each appliance different. You should look for a product that is good at dehydrating food evenly, and the number of trays should also be considered. Wattage is another feature to consider, and in most cases, a higher wattage equates to better performance and drying capabilities. 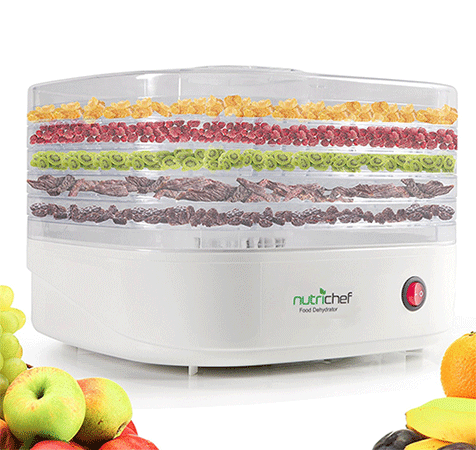 The NutriChef PKFD06 is a popular model, and it’s compact enough to travel with. 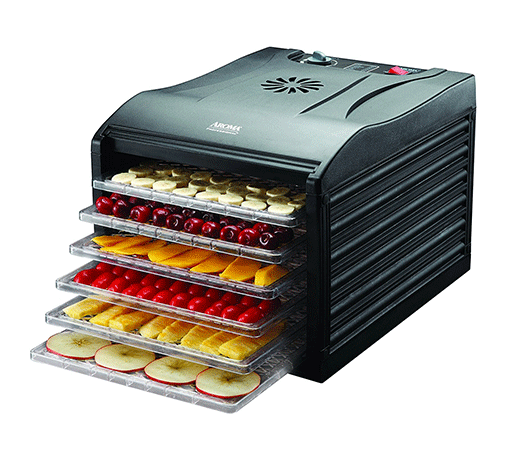 This dehydrator is great for jerky and fruit, and it comes with a total of five trays. With many trays, it promotes enhanced airflow and preserves food for longer. A single button can be used to operate this product, and it can reach a temperature up to 180 degrees Fahrenheit. The Aroma Housewares Professional is large enough to hold six trays, which provides more than enough room for most purposes. 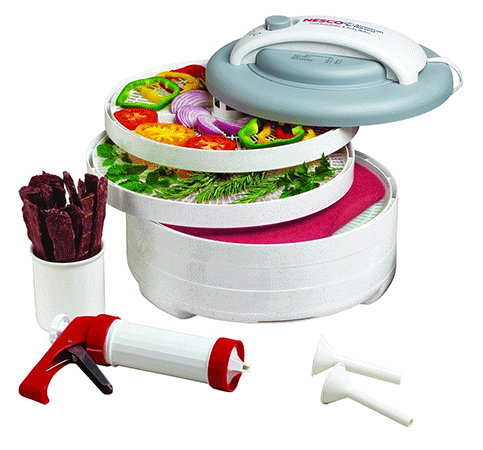 This dehydrator is designed for jerky, vegetables, fruit and snacks. For even drying and enhanced crispness, it has a fan mounted in the rear. Since the Aroma Housewares Professional circulates air, you don’t need to rotate the trays. The thermostat can be adjusted between 99 and 155 degrees Fahrenheit, and you can set it for precise temperatures. The Gourmia GFD1950 is a digital food dehydrator, and since it comes with nine trays, there is enough room to complete large batches of snacks. The large size makes it convenient for dehydrating several snacks at the same time, and with a digital temperature control, you can choose a precise temperature for any type of food. A transparent window makes it easy to monitor the food, and for maximum appliance safety, the Gourmia GFD1950 is ETL certified. The Nesco FD-60 Snackmaster Express is powered by 500 watts, and unlike some other products, it dries food within hours. The Nesco FD-60 has a fan mounted on the top of the device, and the thermostat can be set between 95 to 155 degrees Fahrenheit. With the help of a special drying system, this product stops flavors from mixing, and the fan eliminates the need to rotate the trays. The Nesco FD-60 comes with two jerky spice packets, and it doesn’t take up too much space on the countertop. Here we have the Cuisinart DHR-20, and it can dry many types of vegetables, fruits, herbs and meat. One of the major advantages of this product is that it allows you to naturally preserve food, and it doesn’t require preservatives or additives. The Cuisinart DHR-20 features an adjustable temperature control, which can be set to low, medium or high. With 620 watts of power, the fan is powerful enough to deliver excellent air circulation, and you can use up to nine trays. 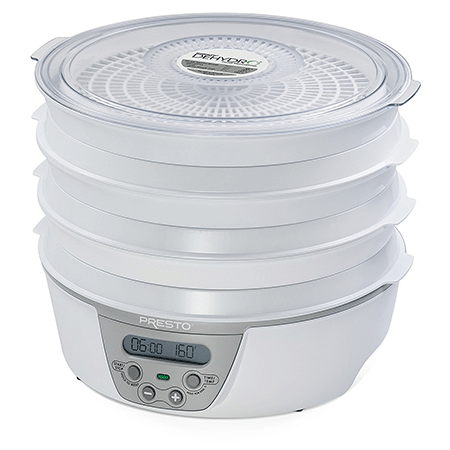 The Presto 06301 is another popular food dehydrator, and for large batches of snacks, it has enough room for six trays. If you’re looking for a way to dehydrate food at a tiny fraction of what you’d pay for commercial products, this appliance is worth considering. It’s great for poultry, seafood and meat, and it comes with sample packets of jerky spice. The digital thermostat delivers precise temperature control, and a built-in timer tells you when the food is finished. The Presto 06301 can be expanded to 12 trays, and with such a large size, it’s great for drying large amounts of food. The Nesco FD-37A is very affordable, and it offers 400 watts of power. It can be expanded to hold up to seven trays, and to make it easier to monitor the drying process, the top of the appliance is clear. A built-in fan produces radial air flow and eliminates the need to rotate the trays. Every component is dishwasher safe, and the Nesco FD-37A can help you save a lot of money on vegetables, dried fruits, jerky and snacks. The Nesco FD-61WHC is an all-in-one kit, and for better air circulation, it comes with a fan mounted in the top portion of the appliance. 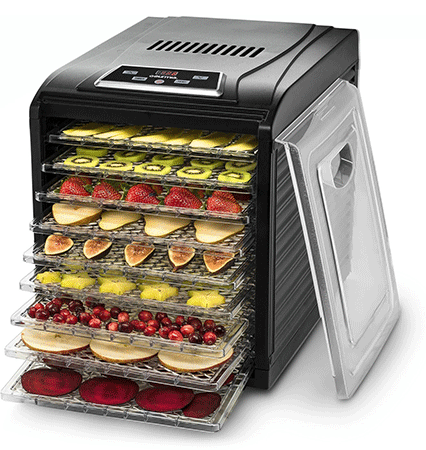 Like other food dehydrators from Nesco, this product will dry your favorite jerky, fruits and vegetables, and it comes with five trays. The Nesco FD-61WHC even comes with a fruit roll sheet and recipe guide. 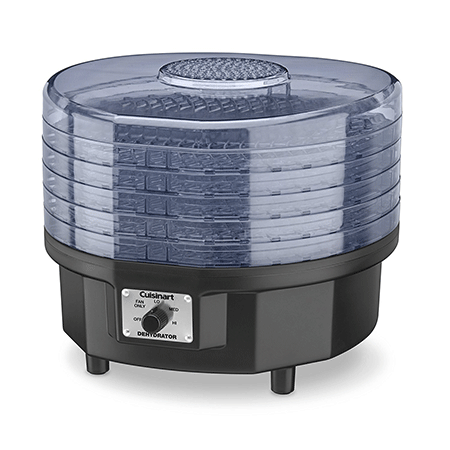 The Excalibur 3926TB is one of the best food dehydrators available, and it comes with nine large trays. 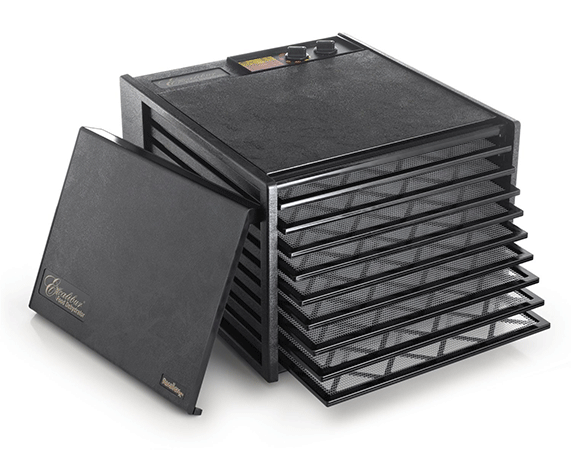 With over 15 square feet of drying space, this is one of the largest food dehydrators on the market, and to prevent foods from sticking, it comes with a flexible poly screen. The thermostat can be adjusted to temperatures between 105 and 165 degrees Fahrenheit. The seven-inch fan is powered by 600 watts, and it keeps air circulating throughout the drying chamber. 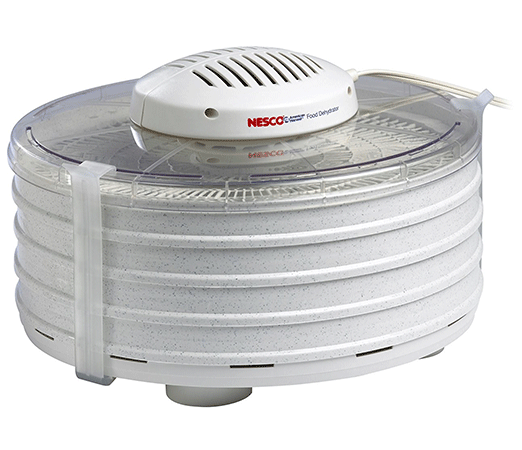 The Nesco FD-75A is a top product, and it’s designed with a fan mounted in the top. The thermostat is adjustable, and it can be adjusted to temperatures between 95 to 160 degrees Fahrenheit. A major advantage of this product is that it doesn’t mix flavors, and the trays don’t need to be rotated. The Nesco FD-75A Snackmaster comes with a recipe book and three jerky spice packets. 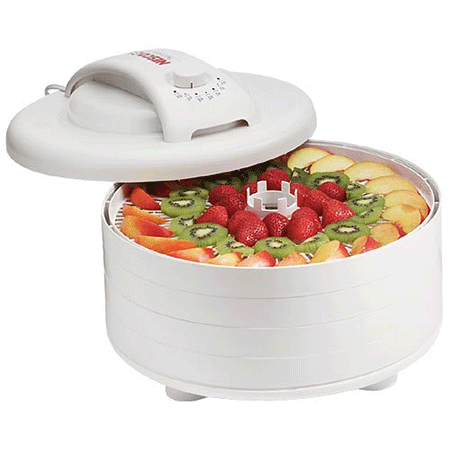 With the best food dehydrator, you can increase the lifespan of your favorite fruit, herbs, meat and vegetables, and it serves as a much more affordable way to produce healthy food for your family. This product will quickly pay for itself, and it can dramatically increase the life expectancy of your favorite types of food.